Sausage Party is the first R-rated CG animated movie in history, and it looks horrifying. Especially if you love food. This supermarket adventure is about one sausage leading a group of products on a quest to discover the truth about their existence and what really happens when they become chosen to leave the grocery store. The film features an epic ensemble of vocal talents including Seth Rogen, Kristen Wiig, Jonah Hill, Bill Hader, Michael Cera, James Franco, Danny McBride, Craig Robinson, Paul Rudd, Nick Kroll, David Krumholtz, Edward Norton and Salma Hayek. Earlier this year, we were treated to the gloriously offensive red band trailer for Sausage Party. Today, we get the green band 'all-audience' trailer from Sony, which cuts back on the raunch but not the gore. This is still one gruesome blood bath of food. And it's incredibly disturbing. Along with this latest footage, we also get the new one-sheet poster that gloriously proclaims, 'This summer a hero will rise!' With this type of witty innuendo and adult themes, this is one animated adventure that certainly isn't for kids. Even though they're going to want to see it. This Pixar spoof is from writers/producers Seth Rogen and Evan Goldberg, and while it might look like it's headed for an NC-17 rating, the creators assured advanced audiences at SXSW that it has already been awarded an R rating by the MPAA. It is directed by Greg Tiernan and Conrad Vernon. And it is definitely not for children, so keep them far, far away. Seth Rogen headlines this adventure as a hotdog just looking to get laid inside a delicious bun. But he soon discovers his destiny lies upon a different path. Here's what co-director Evan Goldberg had to tell us about the movie. "Sausage Party is an existential mock-Pixar movie, and we are very, very proud of it. It's our opus. It's like Mr. Holland's Opus! It's our take on a Pixar movie. It is very, very R rated. I wish there were fifty Pixar movies every year. But listen, someone should take those motherf*ckers down a notch. Those high and mighty bastards. We're mocking all animated movies, with a special eye on Pixar. It is about a sausage in a supermarket. He goes on an epic journey to get back to his isle before the 4th of July, and reunite with his pack of sausage friends." Seth Rogen and Evan Goldberg first made a name for themselves writing and producing 2007's Superbad. Their follow up was 2008's Pineapple Express. In 2013, they directed their first feature film This Is the End, and then returned in 2014 with the very controversial The Interview. They return to cinemas this weekend with their sequel Neighbors 2. Once you watch the latest trailer for Sausage Party, you'll understand why this may be their most shocking and controversial movie yet! They even get away with a 'touching of tips' joke in what is supposed to be a G rated sneak peek. Warning: It is not for the faint hearted. 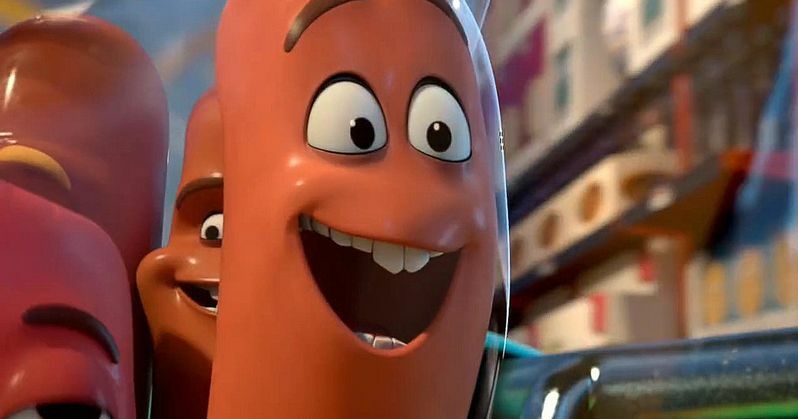 Sausage Party Launches Oscar Campaign, But Can It Win?